After a frosty start, some temperature moderation is expected before another front and another reinforcing chill. We are keeping an eye on rain chances for late weekend and early next week. Today and Tonight: Temperatures will once again max out near 60 degrees. Skies will be mostly sunny early, but a patch of mid-level moisture, which is showing up well on the water vapor imagery, may create some clouds during the afternoon hours. Winds will shift westerly at 5mph. The nighttime temperatures will not be as cold with most thermometers stopping near 40 degrees, as skies stay clear. 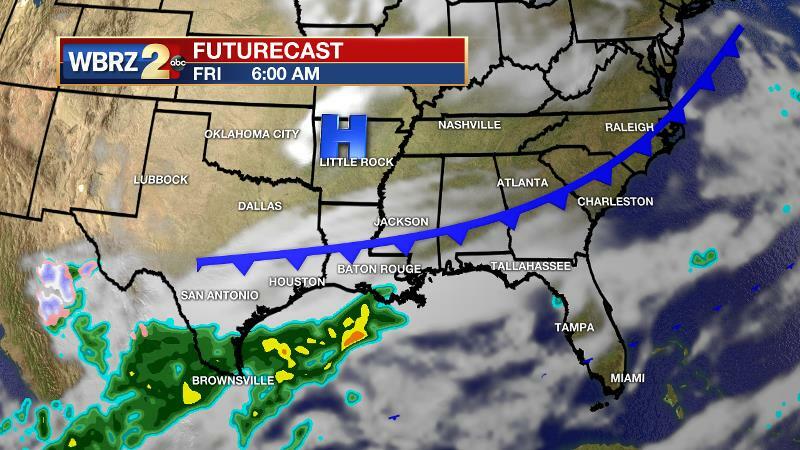 Up Next: Another cold front will pass through the southeast Louisiana and southwest Mississippi on Friday. This one will bring a period of increased cloud cover and possibly a shower to some locations south of I-10 but chances remain low. After another quick chill down behind that front, some more significant thermal moderation is anticipated for the upcoming weekend. Highs will push 70 degrees by Sunday although rain chances are increasing for Sunday and into Monday. 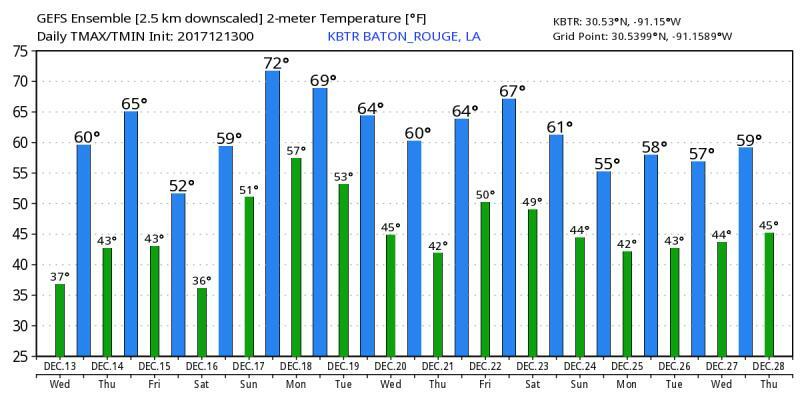 Looking well into the future and toward the Christmas holiday, early forecast model runs are suggesting that temperatures will be close to average—for many that could be considered an improvement over record warmth from the previous years. The Explanation: Some mid-level moisture and positive vorticity advection over south Texas could lead to cirrus clouds over the next two afternoons, but overall limited atmospheric moisture will result in mainly clear skies. Therefore, tranquil weather will continue through Thursday. Temperatures will rebound slightly Thursday afternoon before yet another cold front moves through by Friday morning. A slightly better chance of rain will be possible with this front as low and mid-level moisture moves across Mexico to the northern Gulf coast. However, moisture should only be deep enough south of I-10 and therefore showers will only be mentioned in the forecast for those locations closer to the coast such as St. Mary Parish. The slowing front could also lead to some overrunning stratiform cloud development as it sweeps across the Gulf Coast. The deep trough will bring one more day of colder temperatures for the 24-hour period from Friday to Saturday morning with more frost possible. Beyond this system, the broad trough will move east into the Atlantic Ocean and allow a period of moderating temperatures. Moisture will begin to rise as surface high pressure shifts east and southerly flow develops. A fast moving upper level system will bring the next chance of rain on Sunday and into Monday. As of now, only the GFS and GEM are aggressive and a day late with rain chances while the ECMWF brings the bulk of the rain through by Sunday night. We’ll work out the timing over the next few days.